The Faculty of Native Studies offers the following scholarships/awards. The award values may vary from previous years. gaining research experience in the summer? acquiring valuable skills and experience? working closely with a faculty mentor (supervisor) in a research capacity? looking for a project to develop into an Honours Thesis (NS498)? Apply for a Roger S. Smith Undergraduate Student Research Award with the Faculty of Native Studies. What does the Roger S. Smith Undergraduate Student Research Award entail? This award is intended to cultivate and support research collaboration between undergraduate students and faculty members. This award is an opportunity to conduct research and receive $6,000 to cover 15 weeks of full-time (normally May-August) research-based activity this summer. Your research efforts are not limited to collecting data or writing a literature review, but will result in a final product, such as: a paper, a data base, a memorandum, or a poster. Proposed activities might either (1) be a topic that the award holder (student) has designed; or (2) contribute to a faculty supervisor’s existing research project. This award is not a job, but an internship with benefits. One or two awards are available annually. A faulty member can only mentor one student award holder at a time. An undergraduate student can only hold a Roger S. Smith Undergraduate Student Research Award once. Conditions: Awarded to a student entering an undergraduate degree program in the School of Native Studies from high school on the basis of superior academic achievement (minimum award average of ~95% or above) in Grades 10, 11, and 12. Receipt of funding for the second, third, and fourth years is contingent upon achieving a minimum GPA of 3.5 on a full normal course load in the Faculty of Native Studies each year. Students with an average of 90% or above could receive up to $6,000. The amount awarded depends on admission average and program of study. Be entering the first year of full-time studies in an undergraduate degree program at the University of Alberta in September of the next academic year. Conditions: Granted annually to the student with outstanding academic achievement in Historical or Contemporary Perspective in Native Studies. Conditions: To be awarded annually to the student with superior academic achievement in courses in Advanced Cree. Recipients will be chosen on the basis of academic standing in Advanced Cree. Conditions: Awarded to students with satisfactory academic standing continuing in a Bachelor of Arts in Native Studies / Bachelor of Science in Environmental and Conservation Sciences combined degree. 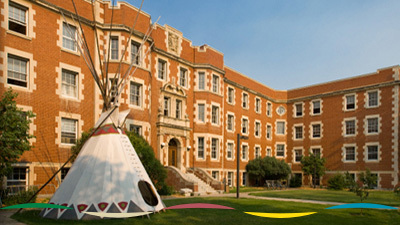 Students must have completed a minimum of 24 units of course weight towards the combined degree while registered in the Faculty of Native Studies. Selection based on academic standing. If no eligible students are found, these may be awarded to students with satisfactory academic standing continuing in an undergraduate degree in the Faculty of Native Studies. Conditions: To be awarded annually to a student of Aboriginal descent as defined by the Constitution Act, 1982, with satisfactory academic standing entering the final year of studies in the Bachelor of Arts (Native Studies) degree program. 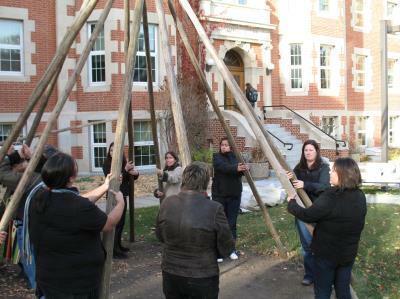 Recipients will be selected on the basis of academic standing, involvement in the Native community, and financial need. Procedure: By application to the Faculty of Native Studies - Applications will be sent in late Winter. Conditions: Awarded to a student with superior academic achievement of Aboriginal descent as defined by the Constitition Act, 1982, Section 35(2) or persons accepted by one of the Aboriginal peoples of Canada as a member of their community enrolled in any year of an undergraduate degree in the Faculty of Native Studies. Selection based on academic standing. Preference given to students from northern Alberta. Conditions: To be awarded annually to a student of Aboriginal descent as defined by the Constitution Act, 1982, Section 35(2) or persons who are accepted by one of the Aboriginal peoples of Canada as a member of their community. Students must have satisfactory academic standing and be entering the second year of studies in the Bachelor of Arts (Native Studies) degree program. Recipients will be selected on the basis of academic standing, involvement in the Native community, and financial need. Conditions: Awarded to a student in a 300 or 400-level Native Studies course who writes the best research paper on one or more of the following 19th century topics: the Plains Indians, buffalo/bison, or the Environment. Conditions: Offered annually to a student entering second, third or fourth year with superior academic achievement in two or more Native Studies courses. Financial need and extracurricular involvement will also be considered. Funded by: Endowed by the family of the late J Edgar and Helen Duncan. Conditions: To be awarded annually to a student with satisfactory academic standing enrolled in the combined BA/BEd Program in Native Studies. Recipients will be chosen on basis of academic standing. Funded by: Endowed by the late Helen Tkachenko. Conditions: To be awarded annually to the student achieving the highest academic standing in NS 152 (Introductory Cree). Conditions: To be awarded annually to the student achieving the highest academic standing in NS 252 (Intermediate Cree).